The best alternative to capture your screen with different modes. More and more people are trying to add voice to their videos. However, the truth is that many of these people tend to have problems with the sound. While sometimes they have no audio at all, other times, they have a sound problem that doesn't allow them to use the voice they recorded for the video. So, what can you do? The first thing you need to know is if your settings are corrected. And the settings are not only the ones referring to the Bandicam software. You also need to check your Windows settings. - The Primary Sound Device should be set to Default Sound Device. In case you don't see this option, you need to right-click on the Bandicam shortcut (that probably is on your desktop), and choose Properties. A new window should appear and you need to go to the Compatibility tab. Here, make sure that the "Run this program compatibility mode for " is unchecked. On the next stage, it's time to check Windows settings. Hit the system's trey and select the "Playback devices" option. Under the Playback tab, on the window that just opened, you need to set the Speakers as the default device. Again on the system's trey, this time choose the "Open volume mixer" option. Just put the volume on all the 4 applications that appear between 70 and 90. At this moment, you shouldn't already have any more problems with the "no sound". One of the most common problems, when you're editing your Bandicam video, is that, sometimes, you just don't have any audio available. Even though Bandicam has a good community that is ready to help you out, the truth is that it can be hard to find information in so many different threads they have on their forum. So, if you have this problem, this might be related to the codecs you're using. 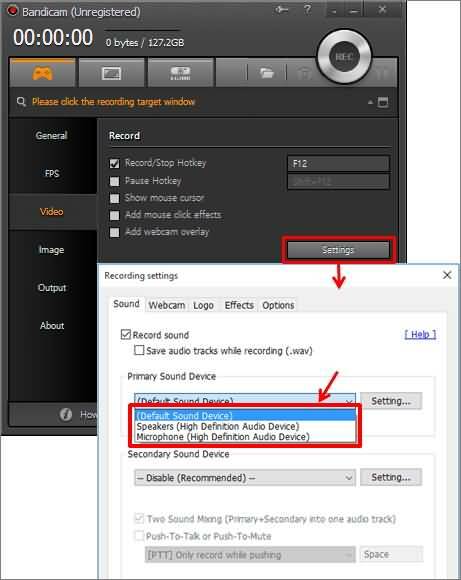 When you're using the default settings for Bandicam, your video will not have audio. So, what you need to do is to go to the Bandicam presets of your video. Here, you'll find the Sony Vegas or any other software that you may be using to edit your video. However, and in the case of the Sony Vegas software, when you click on it, your audio codecs will change from MPEG-1 L2 to PCM. And this is where the problem is. Other video editors just can't recognize the PCM codec, and this is why you get no sound on your video. Plus, when you make this change, your video codec also changes to Motion JPED but you really want to make sure that it is still using the MPEG-1 codec. The only reason for this is that your video will be a lot smaller while maintaining the exact same quality. The truth is that Bandicam is a great screen recording software that you can easily use mainly because of its intuitive interface. However, many people just believe it gives too many problems especially in what relates to video editing. When you want to use the record screen mode, one of the best software you can use is the Filmora scrn Screen Recorder Software. Adding any kind of text or any elements that you can think of is incredibly easy when you're using their video editor. Plus, you'll get the best editing tools that woill make sure that your video will seem that was made by professionals. While you're recording, you can draw circles, use arrows, among others to catch the viewers attention. Plus, you can also choose to change your cursor. From adjusting the size to the shape, and even the color. While this remains true to when you want to make screen recordings, we just can't say that Filmora Scrn is a great option to Bandicam when it comes to game recording mode. This editor really doesn't seem to perform so well when you use this mode and Bandicam is actually preferred.